Sasha Obama, who has lived eight of her 15 years in the luxurious confines of the White House, is learning how the other half lives this summer. The First Daughter is working the takeout window at Nancy’s, a seafood restaurant onMartha’s Vineyard. Sasha, who’s using her full name of Natasha at Nancy’s, has been learning the ropes of the service industry at the Oak Bluffs eatery this week, working a cash register, busing tables and prepping the restaurant before it opens for lunch. Sasha was accompanied to her summer job yesterday by a contingent of six Secret Service agents, who sat outside the restaurant in a large Suburban SUV and on the takeout benches while the president’s daughter waited on hungry tourists. When her shift ended, Sasha and a friend, who also was wearing the navy blue Nancy’s T-shirt and baseball cap, brought a tray of drinks out to her security contingent, got in the SUV and took off. Nancy’s is a favorite stop for the First Family, who always pop in for a seafood feed when they are on their annual Martha’s Vineyard vacation. The Obamas reportedly are friends with Nancy’s owner Joe Moujabber, which is how Sasha scored her summer gig. 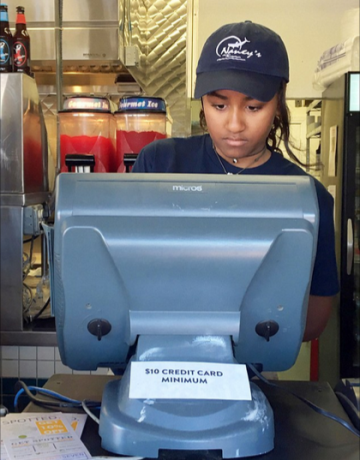 The Obamas’ youngest daughter has been working an early four-hour shift at the busy, 350-seat restaurant, finishing up just a half hour after it opens for business at 11:30 a.m. Word is, she will only be working until Saturday when her parents arrive for their two-week vacation. The Obamas have been attempting to raise their daughters as normally as possible, considering their dad’s job and all. Which may be why they are letting Sasha get a taste of working a summer job in a resort area — a big change from life in the nation’s capital. Sasha and her older sister Malia, who will attend Harvard University in 2017 after taking a “gap year,” just attended their first-ever state dinner in March. The first daughters did get to meet “Deadpool” star Ryan Reynolds at the White House fete and a picture of Sasha greeting the actor as Malia gave her two thumbs up went viral.